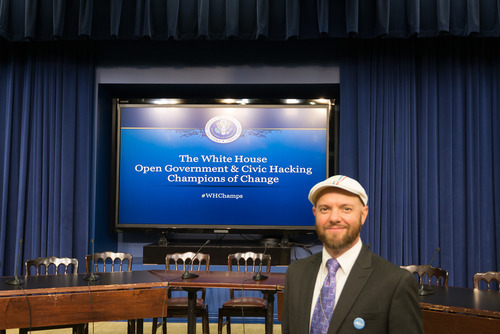 This is my official blog post for the White House website as part of the Champions of Change award I received at the White House today! Being part of the civic innovation community has been an amazing and humbling experience. It has taught me that there are always others with ideas as good or better than my own. The diverse members of OpenOakland, our volunteer organization that I co-founded with Eddie Tejeda in 2012, represent a broad group of technologists, activists, researchers, designers, and residents who believe that our city can and must be better. We’re working to build better interfaces to government that make interaction with government simple and painless. We’re leading the way with effective public-private partnerships and with collaborations that gently move our government to a more accessible, more agile, future. Through OpenOakland we’ve begun work reshaping civic engagement through our CityCamp Oakland and supported civic hacking efforts with our Open Data Day and Code for Oakland Hackathons. More recently we held an incredible collaborative event called ReWrite Oakland as part of the National Day of Civic Hacking where over 70 people worked together to build something new and creative for our city. We’re also publishing open data for our community and we meet every week for hack nights- hacking to improve our government and our democracy from inside city hall!